Before you decide to read this book, grab a box of tissues and your favorite stuffed animal. To say that this book is a tearjerker is an understatement. 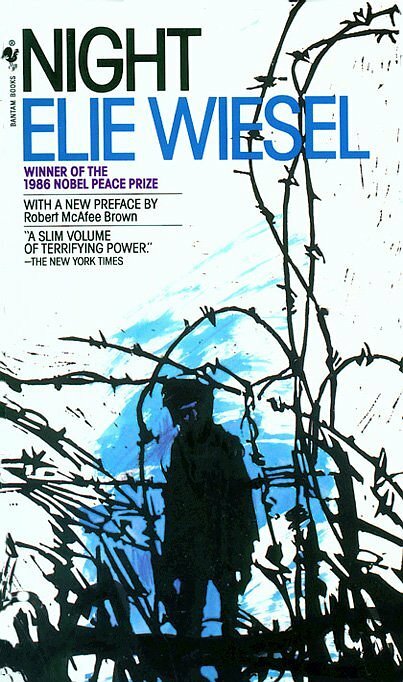 Night is about Elie Wiesel’s real-life encounter in the Nazi death camps Auschwitz and Buchenwald. The are are many books about the unbelievable cruelty that happened during the Holo caust. However, this book puts you in Elie’s shoes and you experience his loss of faith and his questioning of something he knew for sure before. Elie Wiesel was a Jew. This shouldn’t have made much of a difference in his life. When the Holocaust started to creep it’s gnarled claws into Europe, Elie’s life changed in ways that cannot be put into word. He lost his family, his religious faith, and something so simple as compassion for another human life. Elie, being thrown into the work/death camps learned how vicious people get in order to survive. He witnesses how one human being can so easily turn on another. Even as I am writing this review, I have chills. I still find it hard to fathom that so much grief, sadness, and cruelty could actually happen. What shocks me more is that fact that Elie, despite the evils done to him, still found the will to survive. This book makes me sad, but also gives me a bit of courage.